BELLINGHAM, WA -- Sheehan World publisher Kathy Sheehan risked her life by smuggling photos and many yards of fine Chinese silk out of Beijing during a recent trip to the People's Republic of China. In open defiance of Chinese censors, Sheehan also filed a brief report from the ancient Tiantan, or Temple of Heaven, where numerous signs prohibit writing and photography. "I will not kowtow to any censors, no matter how many $50 silk suits they try to bribe me with," the daring publisher said as she modeled a charcoal colored, custom-made suit and a $2 People's Army cap. "No matter how many Mongolian hot pots, bean paste delicacies or Thanksgiving dinners of Peking Duck!" Sheehan fully explored the Temple of Heaven complex, a place of ceremony and ritual for the Ming and Qing emperors. According to her smuggled notes, the emperor arrived at Tiantan every year at the time of the winter solstice to pray to heaven for a good harvest and to honor his ancestors. A magnificent procession through the 675-acre park lasted several days. Built in 1420, many of the ornamental roofs, wooden pillars, and ceilings have been carefully restored. Mythical figures made from porcelain can be found around the walls which were covered in graffiti during China's Cultural Revolution. 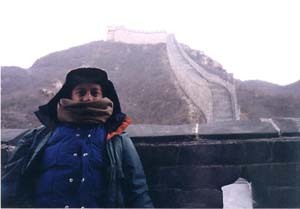 Sheehan was in Beijing for more than a week (in late 1997) on a combination business and pleasure trip with Sheehan World technical editor Chuck Dingée. The two helped facilitate a World Game workshop for executives of the Motorola Corp. which has vast operations throughout China. Dingée, who braved fierce cold at the Great Wall in Badaling and who learned to bargain for souvenirs like a pro, lamented the lack of backgammon games and latté stands in China. "This is an obvious example of the repressive policies of the People's Republic of China," he said as he sipped fine green tea at the Debao Hotel. "I will withhold all "Well Being Units" from the Chinese until they learn to serve proper coffee." 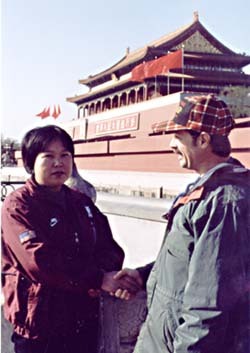 Tiananmen Square, where dozens of Chinese nationals forced the couple to be photographed and where the late great (?) Chairman Mao is entombed. The Forbidden City where they were awed by the ornate palaces, living quarters and ceremonial plazas and halls. Sheehan shot numerous photographs of the entrance to the Forbidden City before guards ordered her to stop. Later, she secretly photographed the mythical animals that adorn every roof corner. The figures were believed to protect the emperor from evil spirits and the buildings from fires set by lightning. Sheehan said she now considers the animals the patron saints of photojournalism. Gu Guanxiangtai, or Ancient Observatory, with its 800-year-old astronomical and navigation instruments. The observatory was the workplace of the famous astronomer, hydraulics engineer and mathematician Guo Shoujing. The Lama Temple Yonghegong where an 80-foot-high Maitreya Buddha made from a single piece of sandalwood fills a three-story pavilion. The Ming Tombs, outside of Beijing, where 13 of the 16 Ming emperors are buried in "underground palaces" covered by a man-made mountain range. Dingée denied his ancestors forced 30,000 war prisoners to build the Dingling, the tomb of Emperor Wanli who was buried in 1620. Please visit The Sheehan World again when our technical editor will post more photos from China.